Didn't you have fun as a kid wearing green for St. Patrick's Day?! You didn't want to get pinched (not sure what that was about) so you tried to wear something, anything green. It was fun. Then as you got older there were the parades and green beer. Rivers are turned green, there are pots of gold at the end of the rainbows. AND there is the promise of spring at the end of a very long winter at the end of March. So in the spirit of St. Patrick, I continued my collage theme from February. Any of your extra papers with green in them can be ripped and stuck onto a clover cut-out, 4-leaf of course!! This is taking the place of the collage heart I made last month. I am keeping these home decor items to use again or even stick in one of my albums. 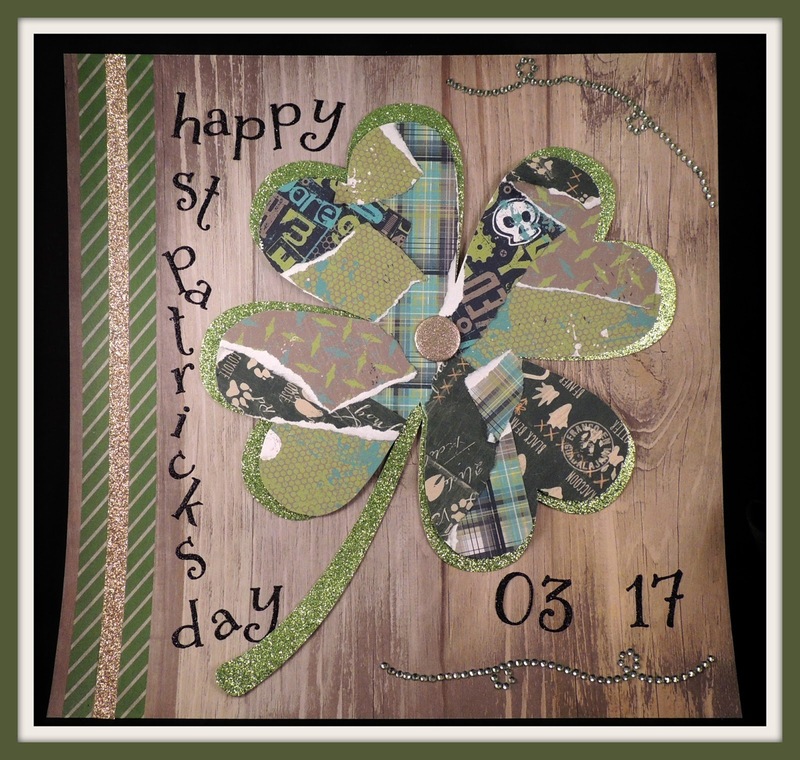 The only current things I used here is the green Washi tape and the gold shimmer tape and the green glitter paper and the shamrock was cut with the Artfully Sent Cricut Cartridge on page 8. Making a fun simple project like this is a good way of using some leftover paper and embellishments that are sitting around taking up space. Do something with them or consider making a donation to your local Children's hospital or a local children's shelter. They will appreciate it I can assure you. I donated some old products to our high school art teacher. She got happy feet!! A Fold-Out Card or Mini Album-You Choose! It's March and a New Stamp of the Month!